Kenneth Cole Laptop Backpack Just $49.99! Down From $240! PLUS FREE Shipping! You are here: Home / Great Deals / Amazon Deals / Kenneth Cole Laptop Backpack Just $49.99! Down From $240! PLUS FREE Shipping! Kenneth Cole Laptop Backpack Just $49.99! Down From $240 PLUS FREE Shipping! Don’t miss your chance! Amazon offers this Kenneth Cole Reaction The Brooklyn Commuter Laptop Backpack for only $49.99, down from $240.00 PLUS FREE shipping! 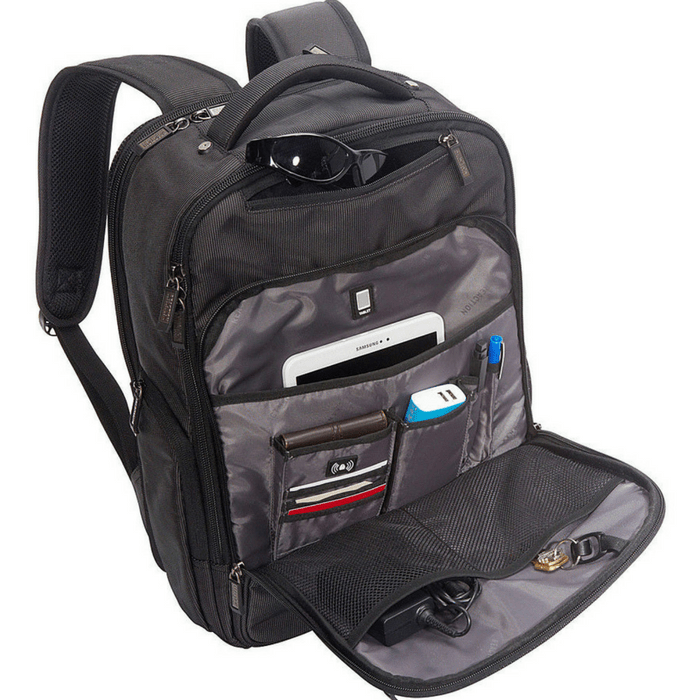 Stroll in style with the Kenneth Cole Reaction The Brooklyn Commuter Laptop Backpack! This RFID laptop bag is made durable with 1680D polyester modernized slim double compartment to make sure that all of your things are secured. It is a slim business computer backpack boasts many interior pockets and compartments for all your business essentials while still maintaining a compact slim construction. The perfect modern professional laptop backpack for travelers who value both style and functionality. RFID blocking protection technology featured in front organizer compartment and in rear trolley tunnel stash pocket to help offer additional protection against modern credit card theft. Designed with checkpoint friendly with an EZ-Scan feature which complies with TSA guidelines so your laptop does not need to be removed when passing through airport security checkpoints. Fits most laptops with up to a 17.0″ screen. Padded tablet pocket compatible with most tablets. Durable 1680D polyester exterior with a fully lined interior.